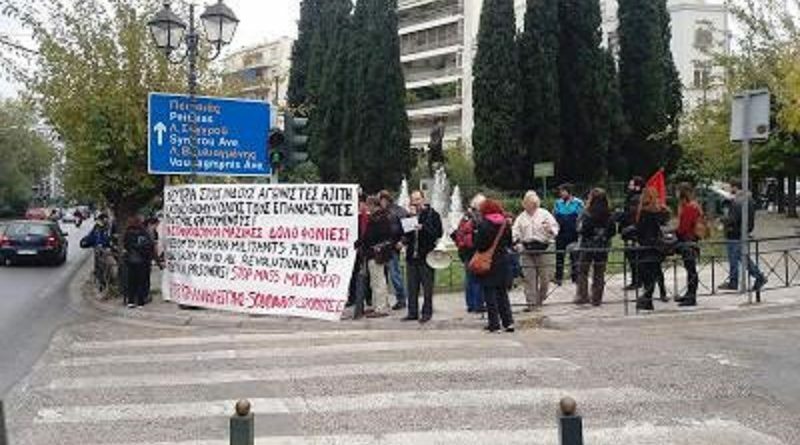 On Saturday 26 November 2016 there was a protest outside the Indian Embassy in Athens. 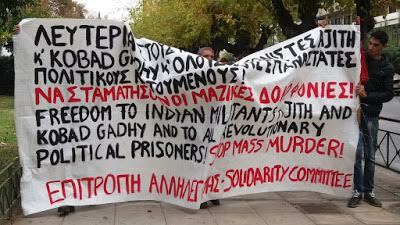 The protesters condemned the continuing imprisonment of Indian revolutionaries Ajith and Kobad Gandhy as well as other political prisoners in India. It was an initiative by the Solisarity Commitee which is supported by Left organizations. In this gathering the protesters shouted slogans of solidarity to the Indian militants and of condemnation of the unjust accusations and the harsh conditions of imprisonment. They condemned the barbaric and murderous policies of the Modi government. Through their slogan they declared that the real terrorists are the imperialists and not the oppressed peoples and the militants who are an obstacle to the imperialist schemes. T he gathering and the resolution of the Solidarity Commitee condemned intensely the mass murders, tortures, rapes and extrajudicial executions that are an everyday occurrence in India in the context of Operation Green Hunt. We demanded a stop to this murderous operation that targets the communists and the poor peasantry who struggle for their land against the plunder of multinationals and mining corporations. The protesters demanded to paste the resolution on the Indian Embassy entrance, but police forces denied them access to the Embassy. There was also presence of Indian security personel who videoscoped the protesters’ faces. Of course we chased them away. 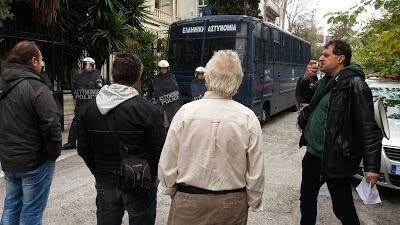 We condemned the denial of our right to paste the resolution on t he Embassy door as well as the attempt to terrorize us by mass presence of police forces. 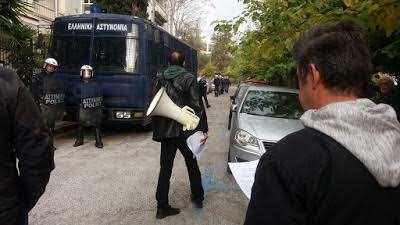 We declare that state terrorism cannot silence all those that want to shout for peoples’ rights! The Solidarity Commitee will continue acting in support of Indian revolutionaries and express in every instance its solidarity!